The cool factor is off the charts. 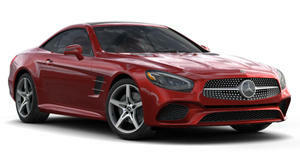 Mercedes-Benz has often been thought of as a fairly conservative automaker. More recently, however, it’s turned things up a notch in order to gather some youth appeal. Mercedes-AMG more than accomplishes that, assuming young buyers have got the cash for entry. But say you don’t and you’re still a Benz fan, and are looking to buy an older one that actually does have both character and modern charm. You won’t feel like an old person driving it. One option is the 380 SLC, a grand tourer with plenty of style. Its 3.8-liter V8 is good for a whopping 215 hp and 221 lb-ft of torque. Hey, it’s from the early ‘80s, so keep expectations in check. But this particular 1981 model year 380 SLC, featured on the latest episode of The Smoking Tire, is really interesting because it’s the Euro-spec version and is void of those ugly front and rear bumpers. This car started life in Europe, was imported to Japan, and ultimately ended up in the US. Its previous Japanese owner even swapped out the original steering wheel for a smaller Momo wheel. Matt Farah is also a big fan of old Benz coupes, and he recently bought one himself. The SLC is a hardtop coupe and is all original, save for the tires. It’s also painted in one of the rarest factory colors offered at the time, China Blue. Is it the fastest coupe out there? Not even close, but that’s irrelevant in this case. The 380 SLC is all about grand touring, and this one does it in fine style – all 3,750 pounds of it (roughly the same weight as a Ford Crown Victoria).